To celebrate the 30th anniversary of World Expo '88, Council has extended the self-guided World Expo '88 Public Art Trail to include additional Expo associated artworks and artefacts. Council has also undertaken a number of restorations and relocations of some of the artworks, giving residents and visitors better access to this fantastic cultural resource. Many sites are located within walking distance of Brisbane’s Central Business District and two artworks are located at the Brisbane Botanic Gardens Mount Coot-tha. Take a closer look at these iconic artworks and landmarks that give residents and visitors a sense of the celebration that World Expo '88 was and the legacy of this city-shaping event. Find out more about World Expo '88 by visiting the John Oxley Library blog. Select an icon to read about each artwork in the public art trail and to view a thumbnail image. As an alternative to the online map, you can view the table for artwork and location information. You can view all artworks in this trail in the 'World Expo '88 Public Art Trail - 30th Anniversary' album or in Council's Flickr account. You can also view artworks in Council's other public art trails in the 'Public Art Trails' collection. 1 'Man and Matter' series by Peter D Cole Kangaroo Point Cliffs Boardwalk, Lower River Terrace The Man and Matter series consists of 12 steel sculptures installed along the Kangaroo Point Cliffs Boardwalk. Originally, these sculptures were commissioned for the riverside promenade of Brisbane’s World Expo '88. Referencing the World Expo '88 theme of ‘Leisure in the Age of Technology’, Cole considers the relationships between humans and technology through simple visual symbology and the redressing of traditional limitations of sculpture. The iconic red figures are a lasting homage to World Expo '88, and a recognition of Brisbane’s advancement into the 21st century. This artwork has recently been restored, as part of Council’s artwork restoration and relocations works for the 30th anniversary. 2 'Gestation' by Baile Oakes Queen Street Mall, Brisbane City Gestation is the first work in a series of monumental sculptures created by American artist Baile Oakes. Commissioned for World Expo '88, the artwork was created in Seattle and flown to Brisbane, where it has remained since. The spiral structure of the sculpture, references the cyclical and balanced nature of our world, which nurtures and evolves all life forms. 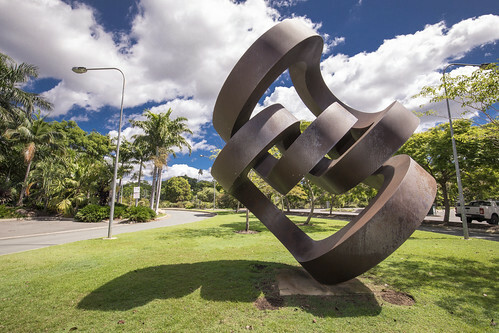 3 'Morning Star II' by Jon Barlow Hudson City Botanic Gardens, close to entrance at QUT In 1988, acclaimed American sculptor, Jon Barlow Hudson, was commissioned to create Morning Star II for World Expo '88. The colossal sculpture was originally installed at the centre of the expo site within ‘Times Square’. Barlow Hudson harnesses the technologies of mirrored steel to integrate and reflect the environment the sculpture is situated within. 4 'Plant Form' by Robert Juniper City Botanic Gardens, Bunya Walk Throughout his career, Juniper created a number of ‘plant form’ sculptures - the forms are derived from his semi-abstract landscape paintings. Originally from Western Australia, Juniper interpreted Australian fauna through abstract rendering of oversized steel planes. Plant Form was loaned by the artist for World Expo '88 and later purchased by Brisbane City Council. 5 'Memories of Wind' by Fumio Nishimura King Edward Park, Wickham Terrace Memories of Wind was one of four sculptures exhibited at World Expo '88 by Japanese artist, Fumio Nishimura. Soft lines of a female figure emerge from the sculpture’s abstract granite forms. The figure remains unaffected by the passing of time in its environment, as Nishimura contrasts the ephemeral state of memory with the permanency of stone. 6 'The Human Factor series - The Juggler' by Artbusters King George Square deck The Human Factor series was created by Brisbane’s Artbusters in the late 1980s. The first iterations of this iconic series were installed throughout the World Expo '88 site. The figure seen here today has been re-imaged and re-cast for the 30th anniversary of World Expo '88, giving residents and visitors a sense of the celebration that World Expo '88 was. 7 'The Human Factor series - The Trapeze Artist' by Artbusters King George Square carpark entry - Adelaide Street The Human Factor series was created by Brisbane’s Artbusters in the late 1980s. The first iterations of this iconic series were installed throughout the World Expo '88 site. The figure seen here today has been re-imaged and re-cast for the 30th anniversary of World Expo '88, giving residents and visitors a sense of the celebration that World Expo '88 was. 8 'The Human Factor series - The Butterfly Catchers' by Artbusters Brisbane Botanic Gardens Mt Coot-tha The Human Factor series was created by Brisbane’s Artbusters in the late 1980s. The first iterations of this iconic series were installed throughout the World Expo '88 site. The figure seen here today has been re-imaged and re-cast for the 30th anniversary of World Expo '88, giving residents and visitors a sense of the celebration that World Expo '88 was. 9 'The Human Factor series - The Dancers' by Artbusters Intersection of Melbourne Street and Manning Street, South Brisbane The Human Factor series was created by Brisbane’s Artbusters in the late 1980s. The first iterations of this iconic series were installed throughout the World Expo '88 site. The figures seen here today have been re-imaged and re-cast for the 30th anniversary of World Expo '88, giving residents and visitors a sense of the celebration that World Expo '88 was. 10 'The Human Factor series - Jennifer' by Artbusters South Bank House, Stanley Street Plaza, South Bank The Human Factor series was created by Brisbane’s Artbusters in the late 1980s. The first iterations of this iconic series were installed throughout the World Expo '88 site. The figures seen here today have been re-imaged and re-cast for the 30th anniversary of World Expo '88, giving residents and visitors a sense of the celebration that World Expo '88 was. 11 'The Human Factor series - Bruce the Unicyclist' by Artbusters Intersection of Ernest Street Parkway and Stanley Street Plaza, South Bank The Human Factor series was created by Brisbane’s Artbusters in the late 1980s. The first iterations of this iconic series were installed throughout the World Expo '88 site. The figures seen here today have been re-imaged and re-cast for the 30th anniversary of World Expo '88, giving residents and visitors a sense of the celebration that World Expo '88 was. 12 'Showdown' by Chris Beecroft Gregory Terrace, Spring Hill In Australia’s bicentennial year, 1988, Brisbane hosted World Expo '88 for a six month period and welcomed more than 15 million visitors. To showcase Australian art for the duration of the festivities, World Expo '88 commissioned some of Australia’s leading artists to exhibit alongside internationally renowned artists in the World Expo '88 sculpture park. In 2018, Showdown was restored and relocated to Spring Hill to celebrate the 30th anniversary of this city-shaping event. 13 'Chair' by Kenneth Armitage Brisbane Botanic Gardens Mt Coot-tha Kenneth Armitage is noted as one of the most significant British sculptors of the 20th century. He is most recognised for his semi-abstract bronze works. Chair was one of seven artworks loaned by the artist to World Expo '88, and was later purchased by Brisbane City Council. Armitage combines traditional, figurative sculpture with everyday forms such as a chair, to reimagine aspects of our everyday world through a surreal lens. This artwork has recently been restored, as part of Council’s restorations and relocation works for the 30th anniversary. 14 'Forme del Mito' by Arnaldo Pomodoro Top of Edward Street, Brisbane City Forme del Mito by internationally renowned Italian sculptor Arnaldo Pomodoro tells the tragic story of Agamemnon from Ancient Greece. Fabricated in cast bronze each piece has its own identity. ‘The Prophet’ Cassandra, ‘The Machine’ Aegisthus, ‘Ambition’ Clytesmnestra and ‘Power’ Agamemnon King of Mycenea. This artwork has recently been restored, as part of Council's restorations and relocation works for the 30th anniversary. 15 'The Rock' by Stephen Killick Captain Burke Park, Kangaroo Point Originally located near the Australian pavilion at World Expo '88, The Rock responds to the theme of ‘Leisure in the age of Technology’. Killick uses international media and events to create a collection of humorous motifs which record the political issues of the day. 16 'INUKSHUK' by Inuit people of Northwest Territories of Canada Victoria Park between Gregory Terrace and Herston Road On the occasion of World Expo '88, Brisbane, Queensland, the people of the Northwest Territories, Canada, offer their congratulations to the Commonwealth of Australia on its 200th anniversary of nationhood. This stone cairn Inukshuk is a symbol of our two countries. High in the Canadian Arctic, Inuit built stone Inukshuks in the shape of humans to direct herds of migrating Caribou to hunters and to act as landmarks for travellers. 17 'Continuous Division' by Greg Johns Roma Street Parklands, situated near the College Close carpark Forged from corten steel Continuous Division is now located at Roma Street Parklands. 18 'Juxtaposition 1' by Robert J Morris King Edward Park Juxtaposition 1 artist Robert J Morris exhibited an artwork from the same sculptural series entitled Rainforest on the World Expo '88 site. Best known for his abstract painting Morris also created sculptural work and jewellery. His work is held in several collection across Australia including the University of Queensland Art Museum Collection. 19 'Mirage' by Gidon Graetz Brisbane Arcade, Queen Street Mall, Brisbane City This optical illusion is another popular piece from World Expo '88. Fabricated in stainless steel the piece looks different from every angle. Notoriously difficult to photograph, Mirage is now located in Brisbane Arcade. 20 'Night Companion (Sky Needle)' by Charles Sutherland Manning Street, South Brisbane Perhaps one of the most well-known artworks from World Expo '88 Night Companion or Sky Needle as it's more commonly known is artist Charles Sutherland’s interpretation of a sculpture by Robert Owen. 21 'Paradigm (Marquette)' by Jon Barlow Hudson Entrance - State Library of Queensland Created by acclaimed American sculptor Jon Barlow Hudson, this work is a sectional model of his Paradigm sculpture, which was created for Brisbane's Expo '88. The original Paradigm sculpture was constructed of stainless steel, measured 30 metres in height, and was a dominant feature outside the USA pavilion at the northern end of the Expo site. Paradigm was based on the double helix of the DNA molecule, and during Expo '88 it housed 66 aeroplane landing lights, making it a memorable feature of Brisbane's night-time landscape. 22 'Vision' by John Ladyman Manning Street, South Brisbane Commissioned for World Expo '88 and now in a private collection. The marble used to create Vision comes from the mines around Chillagoe, a small town 200km inland from Cairns where the artist lived from 1885-1988. Describing the carving process as essentially one directional decision-making process. Once acted upon, the decision to remove more material is irrevocable. For this reason, as the work develops, a heightened state of awareness develops along with it. 23 'The Art of Central Australia' by Papunya painters Plaza Gallery, Brisbane Convention and Exhibition Centre The paintings in this gallery were originally commissioned for display at World Expo '88. They represent a style of Aboriginal painting that emerged from one of the most remarkable developments in 20th century art. In the early 1970s, 250 kilometres west of Alice Springs at the Aboriginal settlement of Papunya, artists began to paint their traditional designs using modern art materials. John Truscott, the Creative Director of Expo '88, originally proposed the idea of commissioning paintings by Aboriginal artists from the central desert for an Expo display at South Bank. The 27 paintings were assembled in 1987. They were installed as part of the Expo Authority’s own pavilion and were displayed outdoors, under protective sails, in a spiral arrangement devised by Truscott. The collection was called The Art of Central Australia. Note: The Gallery is occasionally closed for functions. 24 'Times Square' Museum of Brisbane This commemorative stone features elements from Jon Barlow Hudson’s sculpture Morning Star II, which was installed in the center of the World Expo '88 site, known as 'Times Square'. The complete sculpture is now residing in the City Botanic Gardens. View the 'World Expo '88 Public Art Trail - 30th Anniversary' album.